Can we turn the on Behalf Message on/off? At the moment no. Should you want to send the email as if you were someone else you'll have to get IT to set it up for you. Otherwise you can follow the steps in the delegating access to your inbox tutorial. This will show the Email with the message on behalf of as below. Can you set up a rule that handles emails from a particular domain? Yes - while using the Rules Wizard you can select "With Specific Words in the Message Header". You can then add the domain. "computertutoring.co.uk". Can you force a read receipt? No - at the moment people have the option of refusing to send a read receipt. This means that in Outlook asking someone to send a read receipt is more of a courtesy than mandatory. How to prevent someone from recalling an email? First, in Tracking Options, disable "Process requests and responses on arrival". This prevents the recall from taking place until you actually open the recall request. Moreover, if you have already read the original message before you read the recall message, the recall will fail. Then, via a rule, move recall requests to a new folder upon arrival. Recall requests will fail if the recall message is not in the same folder as the original message, so this prevents it from happening automatically. How can I add a second Timezone? 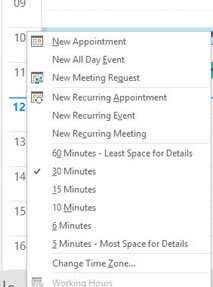 In calendar, either in the (Day|Week|Work Week) Or schedule view right click on the time line to the left (above if you're in schedule view). Then Click Change Time Zone. Check the Show time zone box and use the options to type in the name for the time zone and select the time zone desired.